Where are your favorite stars spending the holidays? See where your fave stars headed this holiday season. LizQuen visited London to spend Christmas with their families and friends. The popular love team posted some adorable snapshots of their London adventure. Maymay Entrata has fulfilled her dream of visiting Germany as she has been tagged along by Edward Barber in the latter's home country. Maymay and Edward were all smiles as they explored the beauty of Germany. Maymay also joined the Barber familys Christmas celebration this year. Wildflower star Maja Salvador had a white Christmas this year in Canada, where her mother is currently residing. Maja has received a lot of blessings this 2017 and spending the holidays with her family abroad is for sure, one of the biggest ones she has received recently. Ylona visited her home in Australia for the holidays. The young singer had some great outdoor adventures with her family and friends in the Land Down Under. Iza has been enjoying the beach and nature in Thailand. The actress traveled to the Southeast Asian country with her fiance and the latter's family. 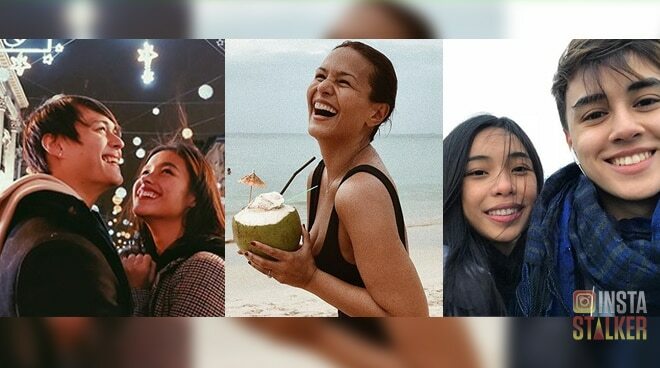 Anne is having a sunny holiday as she visited Siargao this year. The 'Its Showtime' host is with her husband Erwan Heussaff, alongside their family and friends. The couple is back to their "happy place," which is the Balesin Island this holiday season. Ogie and Regine have been spending quality time with their family in the island. Jhong has been enjoying the winter season as he travelled to South Korea this week. Kathryn Bernardo and her entire family are spending the holiday season in Los Angeles, California.